In search of a tree that looks good all year long? Colorful leaves come and go, but limbs covered with white bark appear striking no matter the season. Often, trees are selected and grown for their foliage, fruit, or flowers—seasonal features that blossom and fade over the course of several months—but it’s not impossible to find deciduous trees (those with leaves that often drop over the winter) capable of delivering beauty year-round. The key is to narrow your search to trees with white bark. Even in winter months, when barren, uniquely alabaster branches offer a striking contrast against dark siding, a backdrop of evergreens, or even against the winter sky. While whitebark trees are not rare, they’re not as common as other trees for two reasons: Certain varieties require very specific growing climates, while others are subject to disease and insect infestation. Before choosing a tree, make sure it’s suitable for your geographic region, by consulting the USDA Plant Hardiness Zone Map, which indicates the coldest average winter temperatures by region. Keep in mind that some trees with white bark have additional geographical requirements on top of planting zones, such as altitude limitations, so do your homework for what your property can grow. 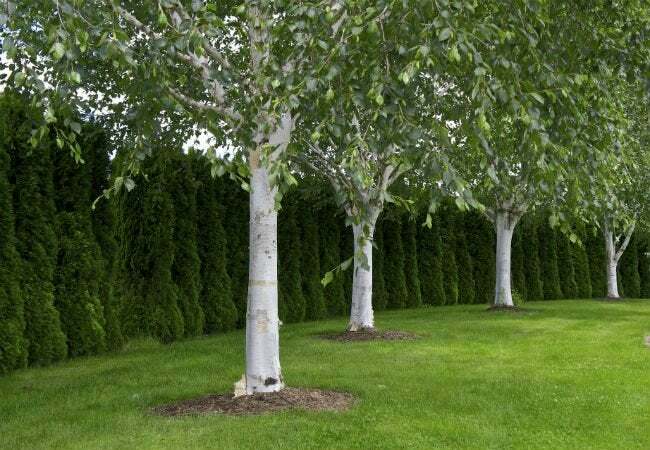 The following four types of trees are among those most commonly chosen for the beauty of their white bark, and, hopefully, one will be just right for your yard. You may be familiar with some species of birch that have beige or brown bark, but a select few species of Himalayan birch (Betula utilis var. jacquemontii) feature creamy white trunks and limbs. Native to the Himalayan region, these birch trees prefer cool, well-drained soil and full-to-partial sun exposure. These birch varieties grow best in zones 1 through 7, although areas where summer temps regularly exceed 80 degrees Fahrenheit can be detrimental to their growth. 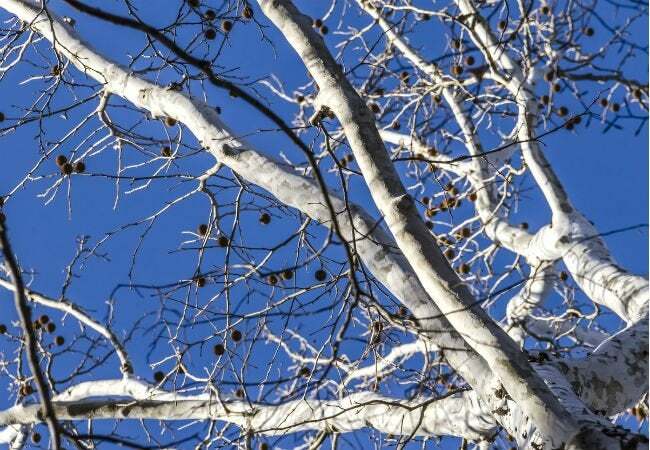 If you live in northern areas of the contiguous United States, Canada, or Alaska, check out the following trees with white bark—though very similar, each has a few special qualities. • Doorenbos (Betula utilis var. jacquemontii, ‘Doorenbos’) grows up to two feet per year to reach a mature height of 40 to 50 feet with a 30-foot crown spread. Doorenbos features peeling white bark that falls away to reveal light orange under-bark. The under-bark turns white soon after the surface layer falls off, and the shedding of its bark is an ongoing process. Brown trailing flowers, known as “catkins,” appear in spring, followed by dark green leaves that turn yellow-gold in the fall before dropping. • Jermyns (Betula utilis var. jacquemontii, ‘Jermyns’), another peeling-bark Himalayan birch, grows about two feet per year until it reaches a mature height of 30 to 35 feet with a crown spread of 20 to 25 feet. Slightly smaller than other Himalayan birch trees, Jermyns is well-suited to smaller yards. The tree forms long brown catkin blooms in spring, followed by heavily ribbed green leaves that turn soft yellow in autumn. • Grayswood Ghost (Betula utilis var. jacquemontii, ‘Grayswood Ghost’) reaches 30 to 50 feet at maturity with a 30-foot crown spread. Grayswood Ghost is a fast grower, gaining up to three feet per year, and its bark is smooth and non-peeling. Expect brown bark on young Grayswood Ghost until the tree is about eight years old; by then, its bark gradually turns stark white. Like other Himalayan birch trees, it develops catkins in spring, followed by green leaves that turn a mellow yellow shade in fall. • Silver Shadow (Betula utilis var. jacquemontii, ‘Silver Shadow’), a slightly slower grower, will climb one to two feet per year to reach a mature height of 35 to 45 feet and a crown spread of 20 feet. Like Grayswood Ghost, its bark is non-peeling, and it features brown catkins in spring and soft yellow autumn foliage. While the trees, themselves, love full sun, the ground around their roots should be shaded. This can be accomplished by adding a layer of hardwood bark mulch around the trunk. Additionally, Himalayan birch trees are prone to infestation by sawflies and aphids, and they can develop diseases, such as rust and leaf spot. For the best results, have your tree checked annually by a tree professional (arborist) and treated as necessary to keep it in top health. 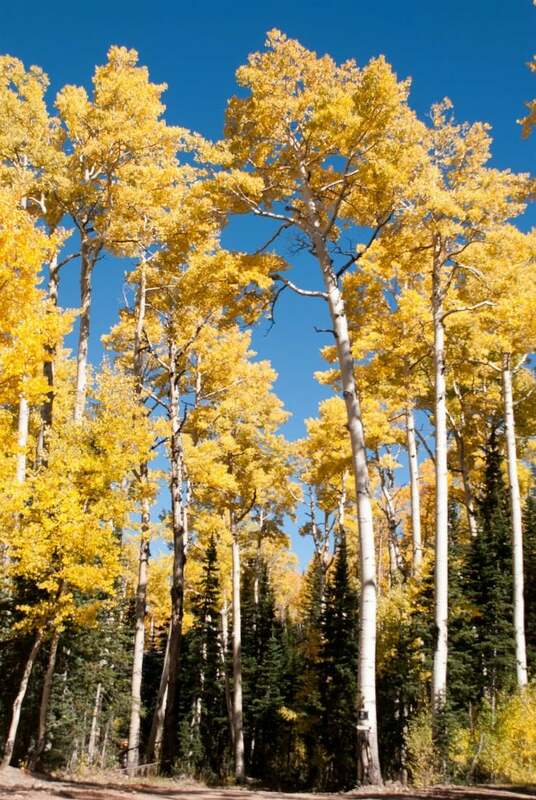 If you’re a fan of colorful autumn foliage, nothing beats the brilliant gold and orange show put on by a grove of Aspen trees on the side of a forested mountain. The American Aspen (Populus tremuloides), also known as “quaking aspen” or “trembling aspen,” produces smooth white bark on a strong vertical trunk that can reach 80 feet at maturity with a narrow crown spread of only 20 feet. American Aspen’s striking white bark will develop contrasting black markings as it matures, which add to its visual interest. 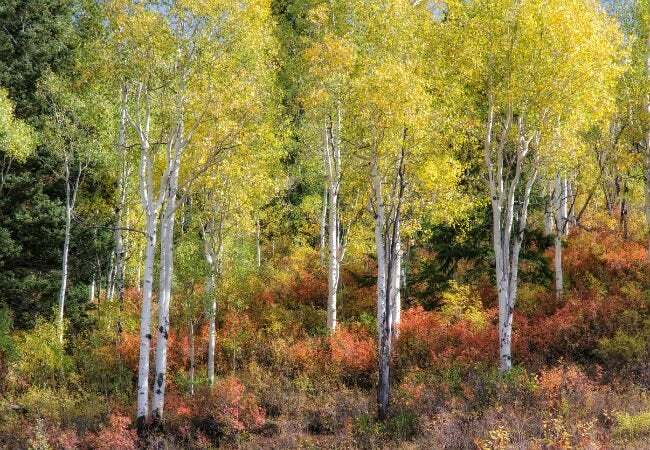 In optimal conditions, American Aspen is a quick grower, growing as much as four feet per year. With its tall, lean stature, American Aspen is well-suited to growing in clumps, and when planted three to five inches apart will produce a multi-trunk effect. It’s just as attractive when planted individually along fences and property lines, or anywhere else a statuesque border is desired. Aspens spread by root shoots, so if you have an optimal location, a few clumps of Aspen could become a spectacular grove in a 15 to 20 years. Reaching an average height of 100 feet at maturity with a similarly wide crown spread, the whitebark American Sycamore (Platanus occidentalis), is a dramatic addition to a large landscape. It grows well in zones 4 through 9, averaging two to two-and-a-half feet of growth per year. It produces insignificant yellow-red flowers in spring that give way to large green leaves (up to nine inches wide) in summer. Brownish non-edible fruit balls develop in summer and eventually dry out, bursting open to release downy seeds. Its mottled white bark, which starts out brown and turns creamy white after 10 to 12 years, makes it a favorite in the winter landscape. Due to its large size (the average mature trunk measures three to eight feet in diameter but has been known to reach as much as 16 feet! ), American Sycamore is best suited as a single specimen tree in a large area where it can reach its full growth potential. It thrives in well-drained, moist soil that’s high in organic matter. The largest American Sycamore specimens are found along waterways so plant this tree near a pond or stream for the best results. If you live in zones 9 and 10 and are looking for a fast-growing, whitebark tree that won’t lose its foliage during the winter months, consider planting a Ghost Gum (Eucalyptus pauciflora). Native to Australia, the Ghost Gum, also called “snow gum” and “white sallee,” has made a name for itself in warmer regions of the US. With its ability to grow up to three feet per year, it doesn’t take Ghost Gum long to become a specimen in the landscape. At maturity, it reaches 45 to 50 feet in height with a crown spread of 25 to 30 feet. 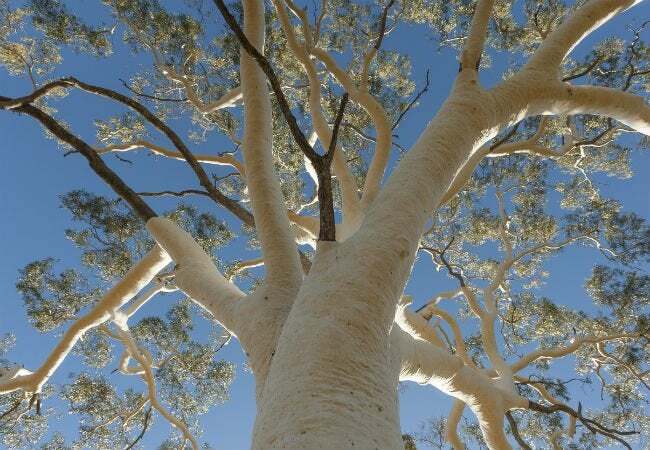 In addition to its creamy colored smooth bark, Ghost Gum features attractive gnarled branches, and the tree emits a faint, but distinct, aroma of eucalyptus. Ghost Gum blossoms from October through December, covering the tree in an explosion of delicate white flowers that offer striking contrast against its deep green waxy leaves. This variety grows in all types of soil, won’t mind drought, and flourishes in full sun (although it will tolerate partial shade). Perhaps unsurprisingly, it thrives in salty coastal regions. Its rapid growth rate and tough demeanor—resistant to smog, insects, and diseases—make it a good choice for planting in urban neighborhoods. Ghost Gum makes a good single specimen tree but is just as attractive when planted in groups of three or more.